Regular JGR readers may remember that my genre of choice is the good ol’ adventure game, with the pointing and the clicking and the fun for the whole family. I’ve played a lot of great ones and more than a few terrible ones, but when asked for my favorite, I continuously return to the first one I ever beat; the title that typifies the perfect adventure game and introduced me to a style and level of humor to which I still aspire to this day. I speak of course of Nancy Drew: Stay Tuned for Danger. 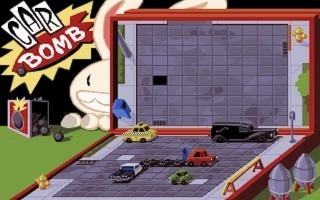 Another okay game, though, is Sam & Max Hit the Road. Sam the canine shamus, and his hyperkinetic lagomorph sidekick Max, were first introduced by creator Steve Purcell in his 1980s comic book Sam & Max: Freelance Police. As the title suggests, the duo are crimefighters for hire. 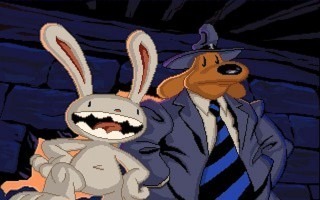 Despite continually ending up with the fate of the world in their hands, Sam and Max never break a sweat, instead relying on their unique absurd humor and insatiable lust for violence to see them through. Thanks to the fact that Steve Purcell was working for LucasArts in the early 90s (check out his art in the first two Monkey Island games as well as Zombies Ate My Neighbors), Sam and Max got their very own game. Hit the Road puts the fuzzy vigilantes on the trail of Bruno, a bigfoot who has escaped from a carnival sideshow, and apparently kidnapped Trixie the Giraffe-Necked Girl in the process. The mystery is further complicated by British country music star Conroy Bumpus, who our heroes continually encounter as their investigation meanders across the entire USA, and hits every cheesy tourist trap along the way. Razor wit and razor teeth. You take control of Sam, with Max following your lead and taking part in the proceedings when necessary. Max himself can be used as an item and remembering this is crucial to some of Hit the Road’s hardest puzzles. Right clicking cycles through your available methods of interaction (look, walk, talk, pickup, use, item) while left clicking will perform said interaction. A little cardboard box serves as your inventory where you can combine and examine items you’ve pilfered. A giant postcard of the country serves as a map highlighting possible destinations for the team’s 1960s DeSoto squad car. You will also be asked to participate in a handful of arcade sequences. Beyond that, the game plays out like any adventure game, though not like any you’ve played before. Stylistically, the game is hard to pin down. The detective elements evoke 1940s gumshoe flicks, particularly the fedora wearing Sam with his Bogey-like vocals. There’s even a film noir mode that turns the game black and white. In perfect contrast to this is a cheesy 1950s “see the USA in your Chevrolet” love for Americana. For no particular reason, your search will always lead you from one tacky roadside attraction to the next with plenty of “Snucky’s” convenience stores in between. SAM: Ooh! They’re genuine Scrantonese potions of fertility. SAM: I don’t think we should risk being any more fertile than we already are, Max. This is at least the fourth time I’ve played this game to completion and not only is it still funny, but I still found myself laughing out loud. The game also offers plenty of little extras to keep you interested if you get stuck. Each Snucky’s store offers “bootleg Sam and Max merchandise” you can buy. These consist of three mini-games: a dress-up kit of paper dolls (formerly used as copy protection in the floppy version), a coloring book, and my favorite: “Car Bomb” a Battleship clone you can play against Max. These neither advance the plot nor earn you any bonuses, but can be opened up anytime, anywhere for a pleasant little distraction. There’s also a highway surfing game on your map. To this day I have no clue what the object is. Max rides on top of the DeSoto and tries either to smash road signs or to jump over them. Or maybe Sam is supposed to avoid them altogether. I seem to earn points no matter how I play. I’m sure there’s a simple explanation somewhere online, but I choose to believe it’s just another case of Sam and Max silliness. But, honestly, I wouldn’t have had it any other way. Everything about the characters Sam and Max is bizarre. Putting them in a logical game would have been completely incongruous and would have damaged the title’s charm. This game is a trial by fire of your adventuring skills. No title better taught me to search every room, talk to every character, try every door, and think completely outside the box than Hit the Road. If you can beat Sam & Max your first time without hints (an honor my youthful impatience unfortunately denied me), you can count yourself among the adventure elite. Dialog is handled with icons representing different possible topics of conversation. Technically, the game is a real achievement. The animators and artists, Steve Purcell included, obviously treated the comic books as their bible. The visual style is infected with that special Sam and Max flair. The time spent on hilarious character animations and background detail is much appreciated, especially because these tweaks could have easily been cut to save cash. For example, while you examine a room, Max doesn’t just stand there waiting. He busies himself by poking at things, looking out windows, and just generally behaving like the wired little rabbity thing he is. Also, before Sam leans down to play golf, he tosses his tie over his shoulder. You have to see it to understand how cool (and adorable) it is. There are even a few helpings of early 3D sprinkled in for good measure. 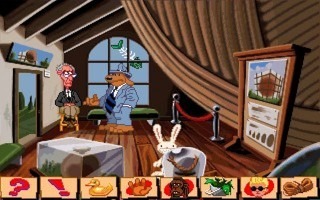 The CD version features full voice including Bill Farmer and Nick Jameson as Sam and Max respectively. The two really nailed these characters who had never been voiced before. It’s a testament to their talent that every future iteration of the duo has imitated Farmer’s gruff, soulful intonation and Jameson’s squeaky New York snarl. Despite this stellar work, two great jokes were somewhat lost in the translation from text to voice. One involves a character who swears in “long hand”, i.e. “*@$*#&%!” and the other a joke in which Max accurately names the programmer’s object number of an item Sam tries to pick up. Even with these concessions, the talkie edition is easily the one to play. Nothing… except it’s kinda hard. SAM: Leave everything to us and we’ll have those abominations of nature back in your protective care before you can read the Koran. MAX: Didn’t he fight Godzilla? As for the game’s difficulty, I honest have never seen it described as ‘hard’ before. You mention the twine – obviously, this is an example of Adventure Game Logic, because it won’t just let you cut a piece anywhere out of the large thing, but nevertheless, it’s not hard to solve. The game shows you the lose end and practically tells you straight you need to get that. It then shows you the helicopter arriving and you’ve got the fish carcasses raining down constantly, so you know how to get up there. When you get to the other location, you will meet the helicopter again and the guy in that location will flat out tell you about it, too. That puzzle is extremely well hinted.